Not long after arriving in Taiwan, I was invited to visit 蓓蓓 (Pei Pei), a Taiwanese spirit-medium. The meeting was arranged by 林渼萱 (LIN, MEI-HSUAN), who had been a student of mine at UAL. 林渼萱 who also helped greatly with interpretation during my visit. 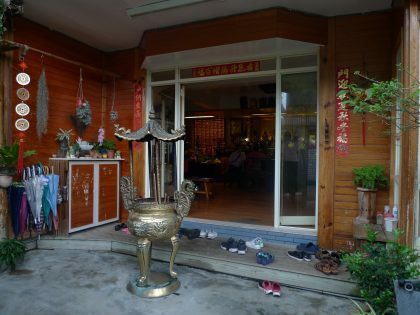 林渼萱 (LIN, MEI-HSUAN’s) mother regularly consults 蓓蓓 (Pei Pei) and kindly arranged for me to meet the medium to interview her about her interactions with ghosts and gods. 蓓蓓 (Pei Pei) practices from her small and beautiful domestic temple, located in a quiet suburban back street in the lush, sub tropical foothills around Taipei. Warm rain was softly falling when we arrived at the temple. The sound of this mingled with running water from a nearby spring. We left our shoes outside to join those of the other visitors already inside. 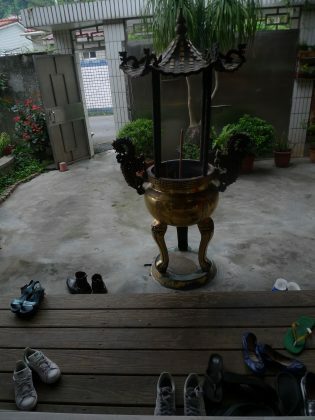 In a small courtyard, the large three legged incense burner sent out clouds of heady fumes. Incense is placed in the burner after a wish has been made to a deity at the temple. In Taiwan a spirit-medium speaks to the spirits of gods and ghosts. The gods or deities may also have been mortals, whose worthy deeds in life allow for their spirit (or ghost) to ascend to the status of a god. The ghosts could be those of a visitor’s ancestor or anonymous lost souls. A spirit-medium consults the spirits of gods for advice, interpreting this advice for those that come for a sitting with them. They may also help directly or indirectly with discontented ghosts, lost souls, aiding these to move on to a higher plain or to find peace for both ghosts and those troubled by them. Inside the small temple there were already many people waiting for their consultation. They were wait on seats around the side of the room where they could also watch and hear other sittings with the medium. As I don’t speak Mandarin, I am unable to follow what is being said. 蓓蓓 (Pei Pei’s) voice and movements are full of energy. 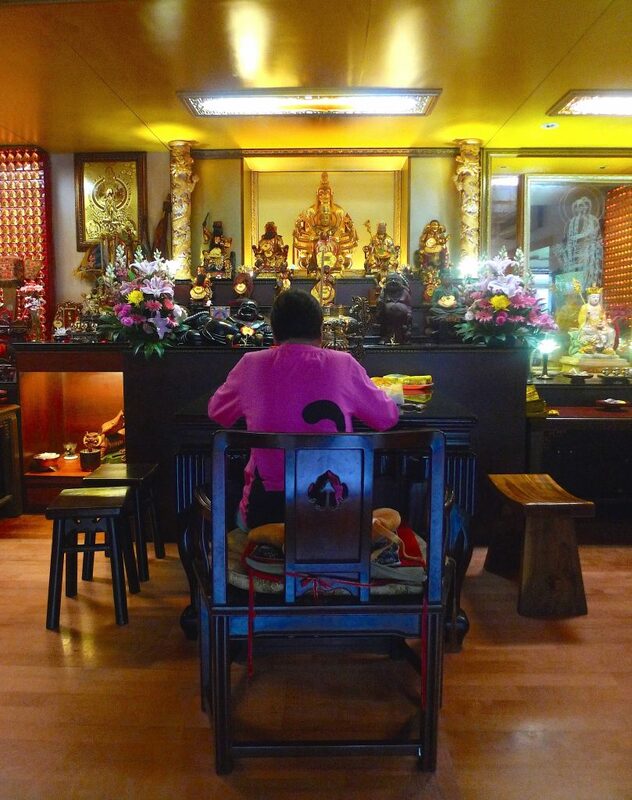 She is wearing a bright pink top and sits at a large table, facing shrines filled with statues of Buddha and other human and animal deities. During consultation she casts two Divination Blocks – crescent moon shaped pieces of wood – onto the floor. The position in which the blocks land direct her in her divination. I have come to interview 蓓蓓 (Pei Pei) about ghosts, but am persuaded into having a consultation too. This makes me a little uneasy and adds to the disorientation I am experiencing from all that is going on around me. However, I accept the offer and decide to embrace it, filling in a card with my lunar birth month, my place of residence, question for the medium and some other details. 蓓蓓 (Pei Pei) is very successful medium and people come from great distances to see her, so I have to wait a while, but eventually my turn comes. I had prepared some questions for Pei Pei in advance and had these translated into Mandarin. However the interview was very much led by 蓓蓓 (Pei Pei) and I soon lost track of and abandoned my original questions. I had planned to ask the same series of questions that I asked ghost experts in Liverpool, but had come to realise how at odds many of them were with cultural practices and beliefs about ghosts in Taiwan – more on this later. Thanks to Ian Thompson who recorded and edited the interview and to 林渼萱 (LIN, MEI-HSUAN) for translating. A second translator, who was there for a consultation, took over during the interview and I would like to extend my thanks to her and credit her by name. I hope that she, or someone who knows her, might see this post and get in touch.